This is the first in a series featuring Mesquite, Texas blacksmith, Bill Epps. A nice introductory collage of images, underscored by folk music and a quote form Longfellow's "The Blacksmith", gives the viewer a clue that these videos are going to be different from most of what's out there on the how-to market. 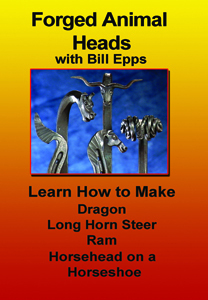 In this video the viewer learns the steps in creating several novelty animal heads out of square stock and a novelty horse out of a horseshoe (Epps began his career as a farrier). The artist also discusses ideas on applications for the items shown. A "chalkboard' segment introduces each item, breaking down the process of creating the heads and showing how the shape of the steel should change in each step. Epps includes tips on technique, including a discussion of the molecular structure of steel and why a smith makes his steel "square, then round", and how to use a cross-peen hammer correctly. Forge-welding can be clearly seen in the making of one of the pieces, and Epps gives tips to the beginning blacksmith on how to get a good forge weld.